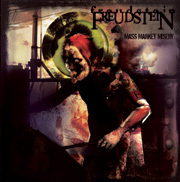 Wasp Factory are proud to present electronic horror masters Freudstein and their stunning new album 'Mass Market Misery'. This Brighton duo seamlessly mix the sonics of horror film soundtracks with two vocalists, guitars, and progressive electronics. Mass Market Misery is an all out attack on the modern world, where the line between fictional and factual horror is intentionally blurred. It is the soundtrack to the social and political decay of our times. It's themes include the 'Robots' anti capitalist trilogy, 'Misadventure's haunting ode to dysfunctional relationships, 'Wings Of Death's guttural screams of social alienation and 'Sister Sleaze's tongue-in-cheek exploration of S & M sexual desires. From the album's outset you are struck by the attention to detail and sheer cinematic quality of Freudstein's accomplished sound. The band combine many of their favorite genres and production styles to create something truly unique. They exploit and rework many different styles including modern electronic and dance, dark ambience, heavy guitars and 70's horror soundtracks. Eclecticism is the key to their sound. This is one album that constantly challenges the listener. It's been four years in the making and has been eagerly awaited by loyal fans of their debut release 'Mondo Freudo'. Freudstein's second album 'Mass Market Misery' is no easy ride in this climate of corporate commercial pop and rock. It is sure to become a cult classic. 'What we have is a strong electronic anthem striking against corporations and media control ? and the people who serve blind loyalty to them....this is an album too good to ignore. 9/10' - TWF Magazine, June 2006.